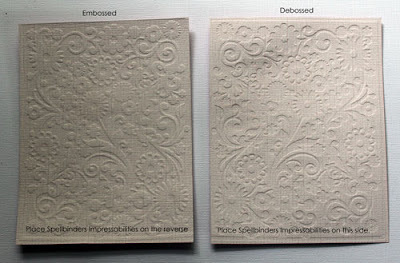 Spellbinders’ Impressabilities templates are made for embossing, debossing, embellishing and more. The templates measure 4.5 x 5.75″, which means they are perfect for embossing an A2 sized card. They are made of thin metal - thinner than common metal stencils. They can get bent after repeated use to you need to be careful in handling them. I store mine in the package (folder) that they come in. Spellbinder dies are compatible with all leading die cutting machines and the packaging for dies includes a handy reference sheet explaining how to use their dies. Unfortunately, the Impressabilities plates do not include instructions on how to emboss/deboss etc. 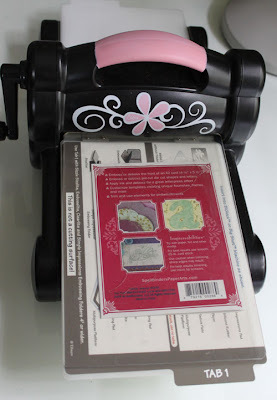 I'm going to demonstrate how to use Impressabilities with the Sizzix Big Shot in this tutorial. 2. A shim -- I use the folder the Impressabilites came in, you can experiment with different thicknesses here. I used Core'dinations cardstock because of the color core that is visible after sanding. You can emboss with the sandwich above by placing the cardstock with the top side down (as in the picture below). A debossed effect is applied when you use place the top side up. Note: Make sure your cardstock is completely dry before sanding. If it's not, it will tear. I learned that the hard way! Here is my finished card. 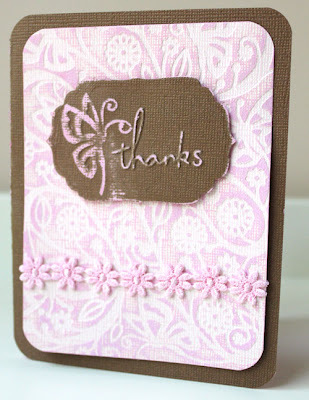 I embossed the Core'dinations Whitewash paper and sanded it to allow the pink to show through. I also embossed some Core'dinations Black Magic, cut out an embossed images and sanded it to use as an embellishment. 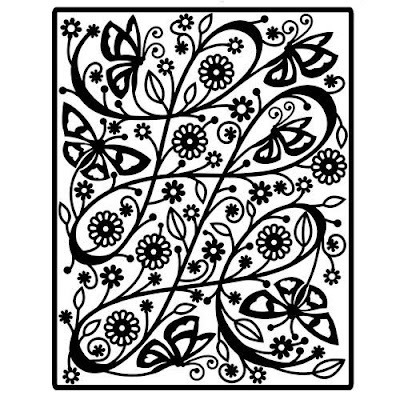 Supplies: Core'dinations Black Magic and Core'dinations White Wash papers, Spellbinders Impressabilities (flowers and butterfly) and Nestabilities dies (classic ovals large and classic scalloped ovals large), Making Memories stickers. If you wish, you can customize the template by trimming certain parts. And more so, you can use the cut pieces as embellishments too. 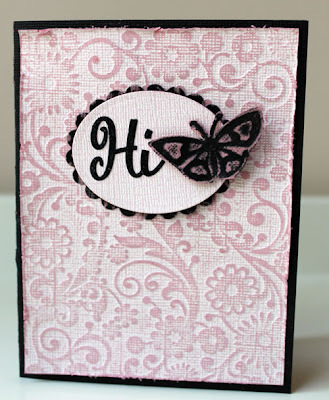 I created another sample card and trimmed a butterfly from the metal template to embellish a label. Supplies: Core'dinations Chocolate Box and Core'dinations White Wash papers, Spellbinders Impressabilities and Nestabilities Labels 4. Cuttelbug embossing sentiment, ribbon. I hope this tutorial inspires you to use these products to create and that you enjoy them as much as I did! This is great - I'd love to know what you'd used in the original sizzix machine for both the embossing and also for their cutting... I've managed cutting, but not much luck with the embossing - any thoughts? beautiful projects and fab tutorial paula! Hi Carol -- I'm a little confused by your question. 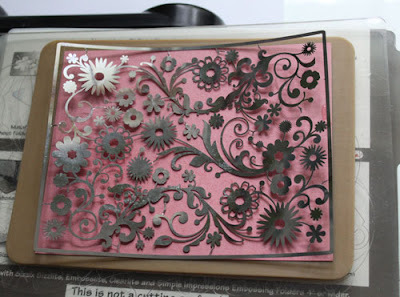 I've shown what I used for embossing with the Impressabilities plate above. 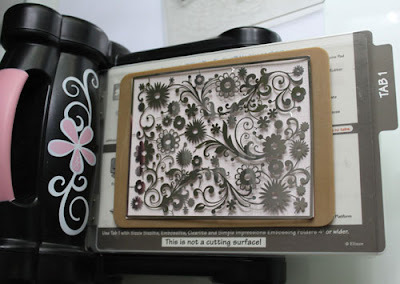 Were you asking about using some other embossing plates? I have been wondering if the nestabilities are compatible w/ the Big Shot! I bought one this year and am just getting into purchasing dies and I have seen so much about nestabilities and impressed w/ how useful they (look) to be....Thanks for the demo on how to emboss! Thank you so much. I recently bought this and hadn't tried it out yet. Now I will know what I'm doing. Great tutorial, thanks I never thought to spritz it with water!!! I will have to try that! Wow, is this nice! The embossing and the use of the Core'dinations. I have played with mine a bit and I found I did have to play a bit to get it to work great.